Monster University movie date with Boo! When I found out that the two lovable monster will be back on-screen, hubby and I got really excited not for ourselves but for our little Boo who is so fascinated with cartoon characters. 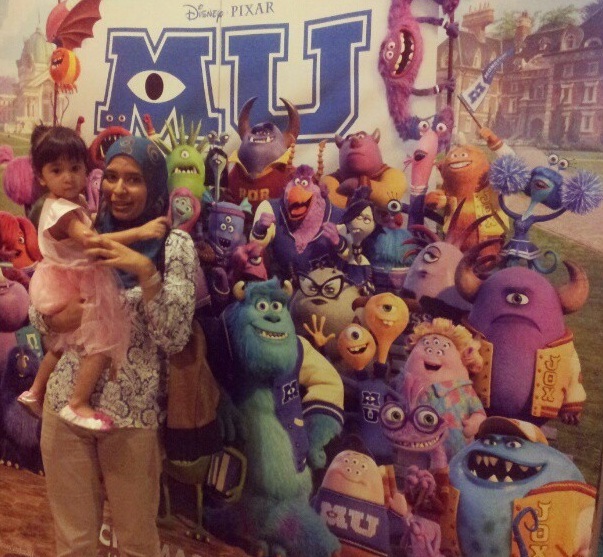 Last Sunday, our little family had a movie date as to kickstart the month of July and watched Monster University! Aulia' was so excited for this movie and on overall the movie was very entertaining. I remember the cute character, Boo in Monster Inc. was just like Aulia'. Even cuter, she laugh and giggle and pointing fingers to the screen each time when she saw Sullivan appear. 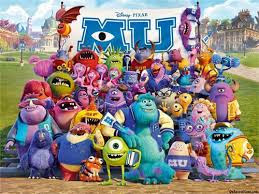 The story focuses with Mike and Sully, two monster just trying to be the best Scarers they can be. And how the worst enemies became best friend in the end. The story has a clear message of never giving up on your dream, no matter what's the obstacles, disappointment as long as you are giving your best and putting your heart into it, you will succeed. Thats the real message that we should deliver to our kids.